Ottawa ACORN members talk to CBC about raising the minimum wage. Members of social justice group Ottawa ACORN and national union members rallied in front of Ottawa-Vanier MPP Madeleine Meilleur's Montreal Road office Wednesday afternoon. Members of ACORN Ottawa say almost 20 per cent of Ontario workers were forced below the poverty line in the three years since the provincial Liberals froze minimum wage at $10.25. ACORN’s provincewide campaign is calling for the rate to be immediately increased to $14, reflecting the rise in inflation since 2010. ACORN Ottawa held a rally in Vanier Wednesday afternoon, demanding minimum wage in Ontario be raised to $14-per-hour and indexed to inflation. Ottawa ACORN member, and volunteer Youth Engagement Coordinator, Curtis Bulatovich was featured on CFRA call in show regarding the $14 Now minimum wage campaign. Advocates for those on disability say they want the province to raise the monthly allowance for those using the program to $1,200 from $906. 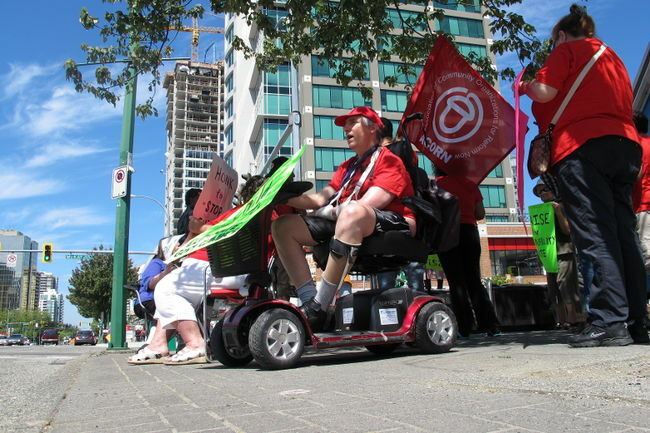 The Association of Community Organizations for Reform Now held a rally outside the Metrotown social assistance office to demand the increase Wednesday. The working poor and students don’t have until 2014, when recommendations from a new provincial Minimum Wage Advisory Panel are set to bump up the lowest wages, anti-poverty advocates (including ACORN Canada) said Thursday. Ontario’s Liberal government is appointing its long-awaited advisory panel on future increases to the minimum wage, which has been frozen at $10.25 the last three years. ACORN Canada members have been very involved in the coalition to raise the minimum wage in Ontario. A group of more than a hundred people gathered on the corner of Pandora Avenue and Quadra Street to bring attention to what they feel should be the number one issue during this provincial election at the Rally To End Poverty in B.C.